An “almost” day? What’s that? It’s a day when you almost turned things around. A day when opportunity knocked and you didn’t hear the door because the dishwasher was running. A day when you had so many things to do that every time you tried to do just one of the things on your to-do list, all the other tasks jumped in the way so nothing got done. An “almost” day. I really don’t like days like this, and I have way too many of them. Do you? If you do, join me in getting organized. Get out your calendar. Find a good to-do list program. What, did you think I was going to mention more spiritual tools? Calendars and lists can be spiritual too, and help you attain your spiritual goals. In fact, I’m beginning to think that nothing is better than old-fashioned organizational tools for manifestation. Put meditation on the calendar if that’s what it takes. Do you see that upside-down Two of Pentacles? Too many balls are getting dropped around here. 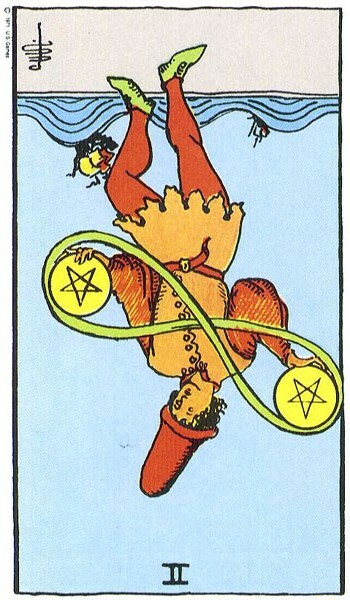 Get organized, pick up the balls, and put them into play again — that should turn our Two of Pentacles right-side-up again. And then you’ll once again be able to juggle the many things that you have to do. 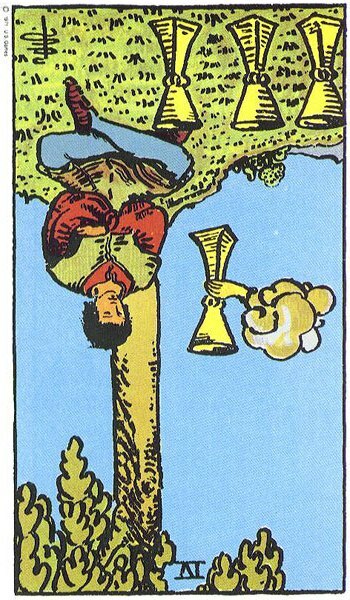 And as for the reversed Four of Cups — don’t miss that chance when it comes. Grab that cup with both hands. Right now the Universe is waiting, nudging, but I can’t guarantee that it will wait forever. Recognize your opportunity when it arrives, and make the most of it.